Peter Christian Hall will attempt to channel Henry James’s older brother William on Sunday, March 4 at (le) Poisson Rouge in Manhattan. 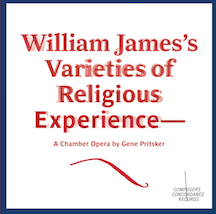 The retired altar boy will narrate William James’s Varieties of Religious Experience, Gene Pritsker’s chamber opera, in its debut. Pritsker has written more than 400 compositions, including chamber operas, orchestral and chamber works, electro-acoustic music, and songs for hip-hop and rock ensembles. (The New York Times has called him “audacious” and multitalented.”) Hall read Allen Ginsberg’s America for a lively Pritsker composition that they performed with numerous musicians in Tompkins Square Park during summer 2011 at the annual HOWL Festival. More recently, Hall read as Pritsker presented America electronically at New York’s MC Gallery during Composers Concordance Festival 2012. Hall has never seen a new opera, much less been in one.